Women must always carry a pepper spray can in their handbag. This pepper spray bottle is compact and easily fits into the handbag. In an emergency situation, women need to spray it in the eyes of the attacker. The spray acts as an irritant to the eyes and skin of the person. One must hold it at an arm's length. Aim to spray on the attacker's face and escape. Inform the police immediately after the act. No matter where you are, feel completely safe when you have this self-defense gun. It is a stun baton gun with a rechargeable torch. It serves as a great self-defense weapon and a flashlight during an emergency. It can be used to strike the attacker if they attempt to disarm you. It has a high voltage shock which will stop your attacker in their tracks and give you the chance to escape. Fire up the stun gun and it turns into a volt trashing self- defense device, powerful enough to fend and immobilize an attacker. This folding stick is compact yet very effective as a self-defense tool. 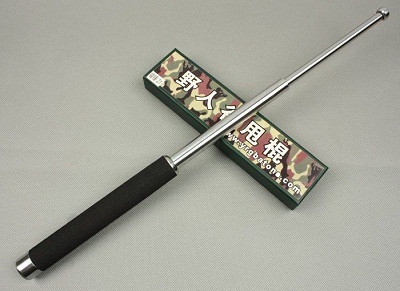 When struck with the right pressure, this iron stick can cause a lot of damage to an individual. The 8 inches stick turns to a 26" stick with the flick of the wrist. 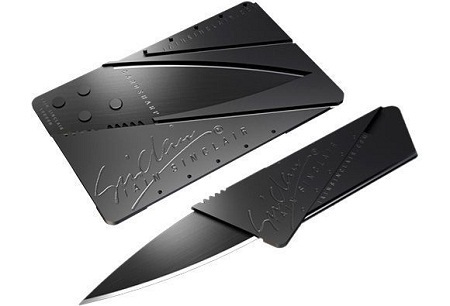 This credit card knife is as slim as a real credit card. The knife is slimmer and lighter than a regular knife. It acts as a self-defense tool. 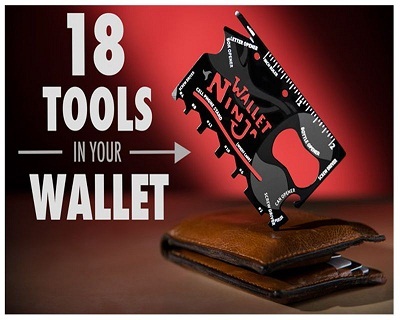 This perfectly flat tool packs 6 wrenches, 4 screwdrivers, 2 rulers, a cellphone stand, a bottle opener, a can opener, a letter opener, a box cutter, and A fruit peeler into a single piece of steel the size of a credit card. Besides being a utility tool, the sharper tools in this toolkit can act as a self-defense tool as well.